How to Pin an item permanently in PowerPoint 2013 ? There are times when you want open few frequently used PowerPoint slide frequently in Microsoft PowerPoint 2013 . You can use the Open -> Recent Presentations option in this case . Sometimes you might want to pin this presentation file in the top of the Recent Presentations list. 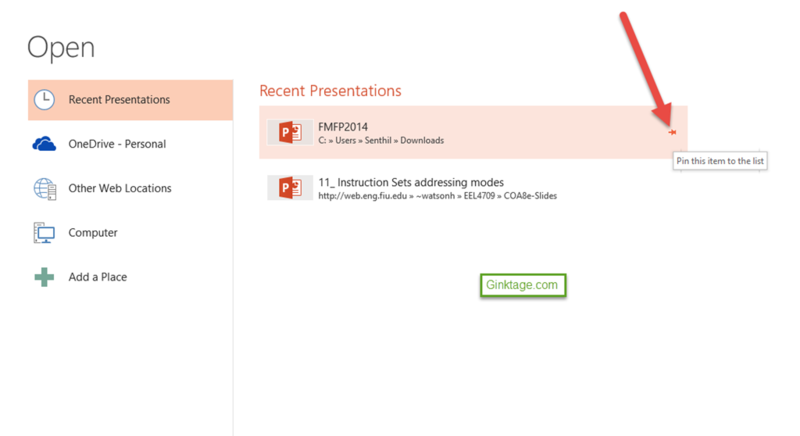 To pin a file to the Recent Presentations list , click the pushpin icon which is usually found in the right side of the file name in the “Recent Presentations” menu as shown below.